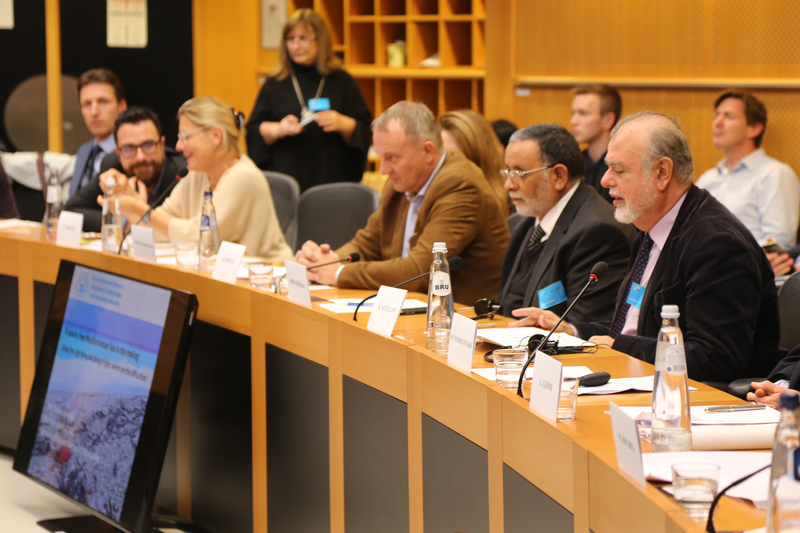 On the 21st of November the Seas, Rivers, Islands and Coastal Areas Intergroup (Searica) met with MIO-ECSDE and the informal Circle of Mediterranean Parliamentarians for Sustainable Development (COMPSUD) at the European Parliament in Brussels. 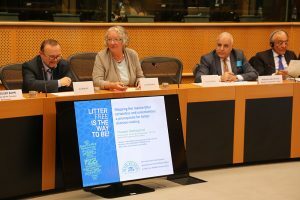 This was a unique occasion where Members of the European Parliament and Members of Parliament of non-EU countries came together with marine litter experts, environmental NGOs, journalists and other key stakeholders to explore the next steps in achieving a litter-free Mediterranean Sea. The event was attended by some 65 participants from 20 or so countries. The setting of the event was framed by the MIO-ECSDE Marine Litter expert, Dr. Thomais Vlachogianni, who provided a comprehensive overview of the certainties and uncertainties related to marine litter and plastic pollution and in particular as prerequisites for better decision making. 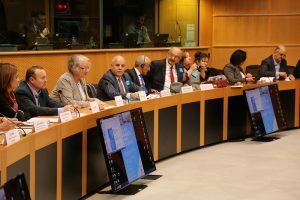 The chairman of COMPSUD, Professor and member of the Moroccan Parliament, Mr. Moh Rejdali laid out the challenges on the South shores of the Mediterranean and stressed that one of the most urgent actions needed in a country such as Morocco is to enforce the existing legal frameworks and invest in capacity building and education. 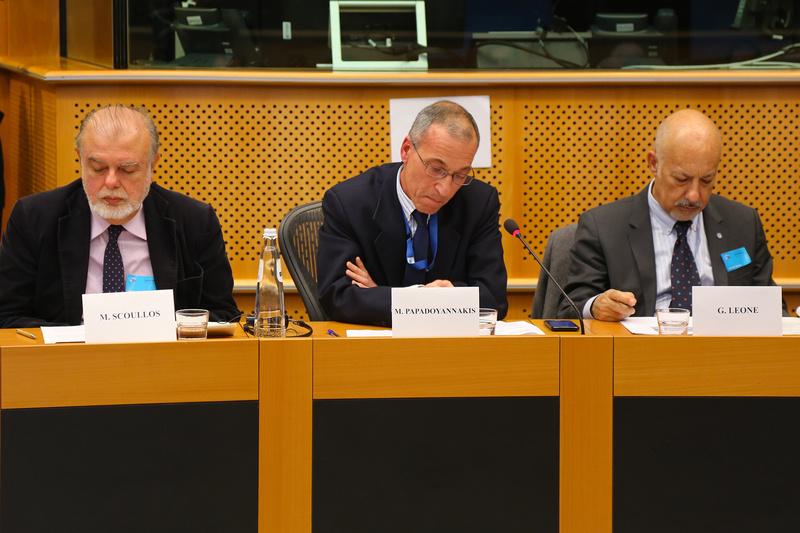 In the second part of the meeting, Mr. Michail Papadoyannakis, Directorate General for the Environment, and Prof. Michael Scoullos, Chairman of MIO-ECSDE provided the frameworks and prerequisites for ‘doing things right’ when it comes to efficiently addressing the issue at hand. Mr. Papadoyannakis welcomed the increase of public attention and the proliferation of related initiatives. 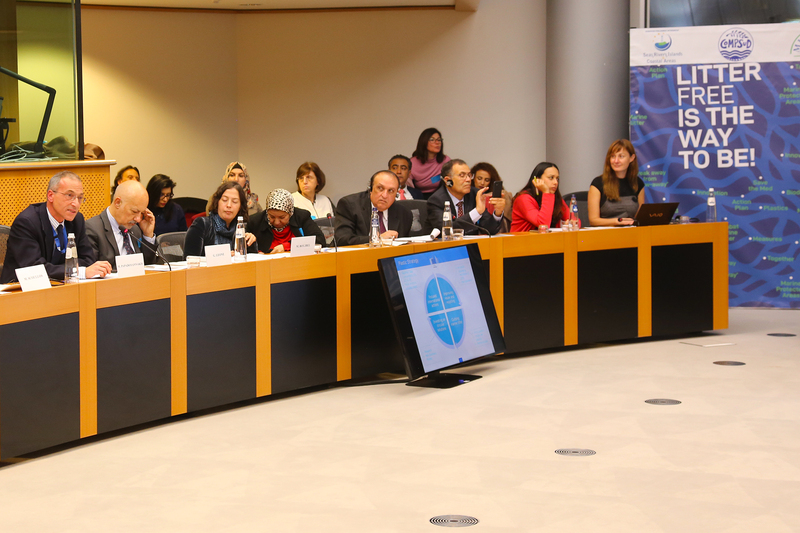 However, he stressed the need for these to be channelled and focused to areas where effective measures are possible and urgently needed. 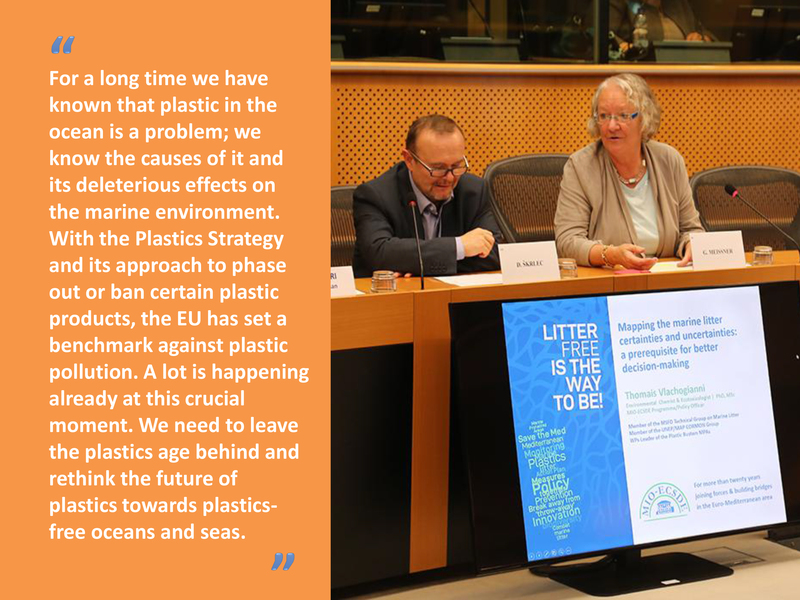 He also provided an overview of the EU’s comprehensive policy framework and substantial financial support (within and outside the EU) and reaffirmed the EU’s unfailing commitment for improvement of international governance at all levels and the provision of a comprehensive response to the threat of plastic litter, including microplastics. Mr. Bernard Merkx co-founder of WasteFreeOceans, Ms Silvia Freni Sterrantino of the European Plastics Converters, Ms Elvira Morote from the Fishery Producers Organization of Almeria and Mr. Bart Vandewaetere, from Nestlé Europe, Middle East & North Africa, provided the private sector’s perspective on the challenge of tackling the marine litter problem, while Ms Francoise Bonnet from ACR+ the provided the viewpoint of the local authorities. 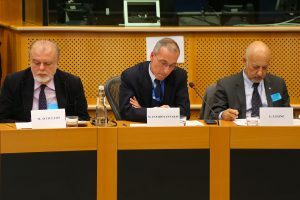 This meeting was organized by Searica and MIO-ECSDE, with the financial support of the LIFE+ operating grant for NGOs. 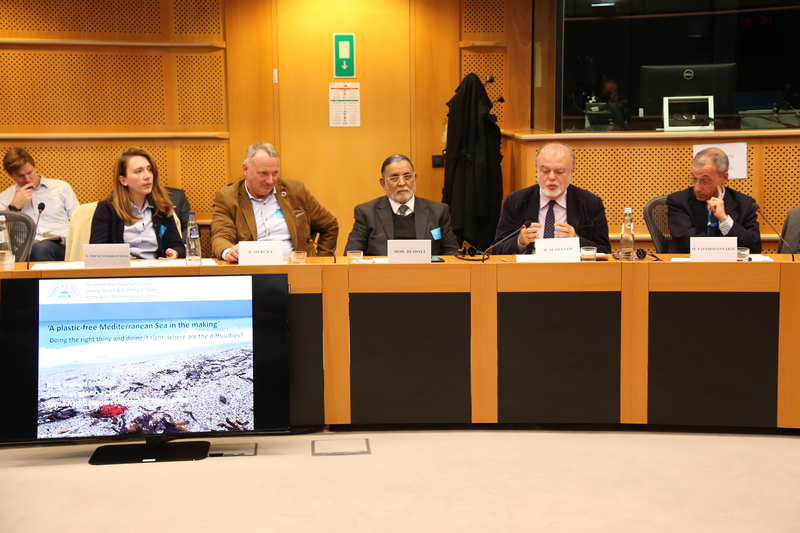 MIO-ECSDE organizes on an annual basis dialogues between Parliamentarians, NGOs, journalists and other stakeholders on current environmental problems. Joining forces is the fundamental premise for the promotion of sustainable development in conditions of peace and cooperation among all countries and peoples of the Mediterranean region.